Though it was late Fall the weather in northern Arizona's Four Corners region was warm, bright and glorious. There was little traffic on US 264 east of Ganado on the vast Navajo reservation and I looked for images that would depict the high desert and its empty beauty. 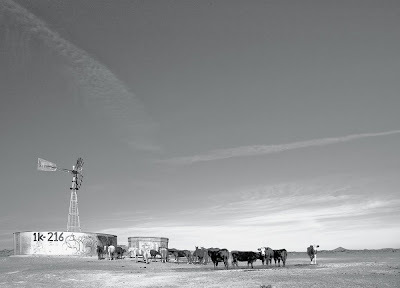 Out the side of my left eye I saw an iconic southwestern scene with cattle and horses gathered around a stock tank. Consulting my Gazateer I discovered that the nearest settlement was called Cow Spring. I really like the Cow Spring, the tall sky really gives the empty feeling.